Stockholm University Institute for Turkish Studies (SUITS) is located in Kräftriket, within easy reach of the capital city. There are a number of airports in the wider Stockholm area. Arlanda is the main Stockholm airport, though there are other airports at Bromma, Skavsta and Västerås. There are regular express coach services between the airports and Stockholm central station. More information is available from the bus company websites, including www.flixbus.com and www.flygbussarna.se. The local travel service in Stockholm, SL, also runs travel services to and from the city centre. Check www.sl.se for more information. Taxis are generally available outside of the airport building, or can be booked in advance. 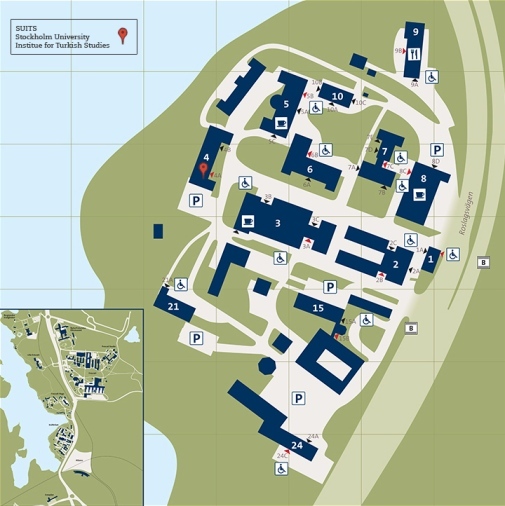 Take the Metro (red line, northbound) to Tekniska högskolan and then change to bus 670 and get off at Albano, or continue on the Metro to Universitetet and walk to Kräftriket from there. The journey takes about 20 minutes. Taxis are easily available at the airports and central station.